This is why you should talk with the surgeon first about what you want from the procedure. It’s easier if you just want to look younger and more energetic — you already know you want to look like yourself on your best day about ten or fifteen years ago. The surgeon will need to look at your face and tell you what procedures would best achieve this. It’s trickier if you want rhinoplasty, a cheek or chin implant or work done on your lips, and this will require a greater understanding of the human face on the part of the surgeon. Two of the most popular forms of facial cosmetic surgery are rhinoplasty and eyelid surgery. Lifting the malar pad (the fat under the cheek that creates that baby-faced look) is another popular one. Otoplasty, or ear surgery, is more often performed on children. All forms of facial cosmetic surgery involve a certain amount of preparation and time spent recovering, which a surgeon can tell you how to manage. But you might not even need surgery. BOTOX, lasers and fillers might be enough for your needs. An expert in facial cosmetic surgery can tell you exactly what you need. 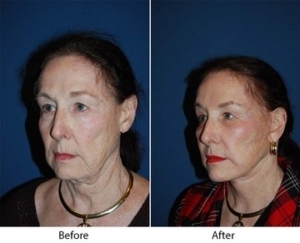 Dr. Sean Freeman is the most experienced facial plastic surgeon in Charlotte. He has been certified by two different surgery boards, the American Board of Otolaryngology (head and neck surgery) and the American Board of Facial Plastic and Reconstructive Surgery. He has practiced nothing but facial plastic surgery since 1988, including improvements to plastic surgery done by other doctors. If you want to try facial cosmetic surgery, make an appointment or request an online consultation today.